WELLFLEET, Mass. — A man was bitten by a shark Saturday in the water off a Cape Cod beach and died later at a hospital, becoming the state’s first shark attack fatality in more than 80 years. The 26-year-old man from Revere succumbed to his injuries following the attack off Newcomb Hollow Beach in Wellfleet at around noon, Wellfleet Police Lt. Michael Hurley said. The victim was identified as Arthur Medici by the Cape & Islands Assistant District Attorney. 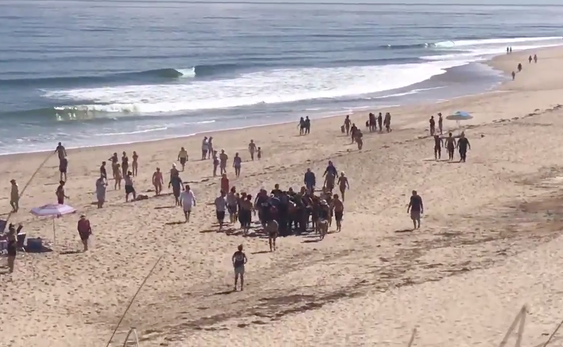 Beachgoers at Newcomb Hollow Beach help carry a victim of a shark attack. Visitors to Newcomb Hollow Beach are greeted by a sign warning them to “Be Shark Smart,” CBS Boston reports. The sign advises to avoid swimming near seals, to swim close to shore in waist deep water, and to swim or surf in groups. There have been frequent shark sightings this summer along the outer Cape, often leading to beach closings. The National Park Service, which manages many of the picturesque beaches where white sharks tend to congregate, said it closed beaches for at least an hour about 25 times this year – more than double the annual average. Troy, of Boston’s Dorchester neighborhood, was visiting an uncle and was swimming about 50 feet offshore when the shark attacked.